Apr 16, 2019 | Categories: Policy Updates. Apr 11, 2019 | Categories: Guest Perspective and SHC Perspectives. Apr 4, 2019 | Categories: Policy Updates. On April 1, the Homeless Children and Youth Act (H.R. 2001) was reintroduced in the U.S. House of Representatives by Congressmen Steve Stivers (R-OH) and Dave Loebsack (D-IA). Get the facts about the Homeless Children and Youth Act, including frequently asked questions, the full text of the legislation, and a list of supporters. Apr 1, 2019 | Categories: Policy Updates. Mar 22, 2019 | Categories: Policy Updates. Take action by March 26 by sending "Dear Colleague" letters to support funding for homeless children and youth programs. "Dear Colleague” letters provide critical and time-sensitive opportunities for federal funding advocacy. They are requests from members of Congress asking other members of Congress to show their support for funding for certain programs. Mar 22, 2019 | Categories: New Resources. Mar 15, 2019 | Categories: New Resources. This memo explains the legal requirements to use state and local McKinney-Vento funds to benefit homeless children and youth exclusively. Mar 13, 2019 | Categories: Policy Updates. 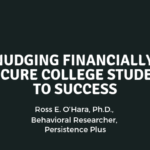 On March 13, 2019, bipartisan, bicameral legislation was introduced to remove barriers to higher education access and success caused by homelessness and foster care. The Higher Education Access and Success for Homeless and Foster Youth Act of 2019 (HEASHFY S.789/H.R.1724) amends the Higher Education Act to simplify eligibility for federal financial aid and to improve outreach, resources, and policies for homeless and foster youth. Dear Senator, I Was Once Homeless. Higher Education Was My Way Out. Mar 8, 2019 | Categories: Guest Perspective. 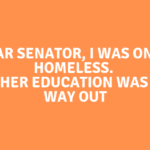 "When I learned about SchoolHouse Connection’s Tennessee legislation to help college students experiencing homelessness, I immediately was compelled to reach out to my legislators asking for their support. I know the tangible, long-term value of education in overcoming homelessness. I know it because I have lived it. Here is my letter to my legislators urging them to support legislation to help college students experiencing homelessness." Feb 27, 2019 | Categories: Guest Perspective.